Apple knows how to keep its users engaged. 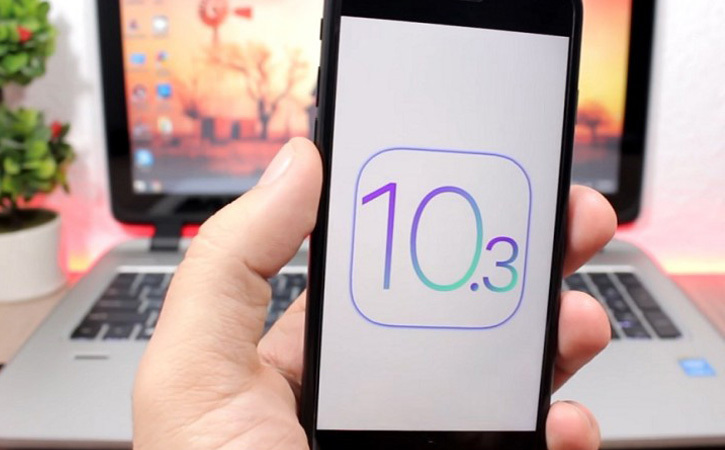 After 7 beta releases, they have finally launched the iOS 10.3 for the masses. This doesn’t end the good news. The real news is that after installing the new OS on their iPhone, iPad, and iPod touch, users have noticed their device working faster and more responsive. Well, this isn’t all. With the launch of this new version, Apple has also bid farewell to its 19-year-old HFS+, which was the based on 32-year-old HFS and replaced it with Apple File System (APFS). Now, this is a big step. The new inclusion not only saves the space but also optimize it for solid state drives (SSDs). Every time Apple releases a new update, the users without any delay download the new version. Though there are many misconceptions about iOS, this trust and loyalty are no doubts result of the uncompromised security they give. The users never try to look for the new features that are being released. They are easy to lose. Keeping this in mind, Apple introduces new Find my AirPods feature. The feature comes activated in the new OS. So, if you forget where you kept your AirPods last, dropped one/both of them somewhere, or lost. Simply go the Find my iPhone app and you’ll notice the new icon for AirPods. 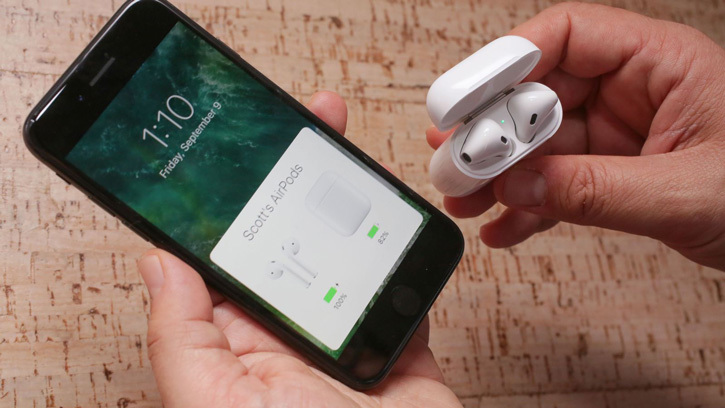 If your AirPods are connected to the device via Bluetooth, the feature will play a high pitched sound that will help you find them. However, if it isn’t, the map will show you the last location where it was connected to the device. This one is especially for the cricket lovers. Our assistant Siri now understands that Cricket is a famous sport, played in different countries across the globe. 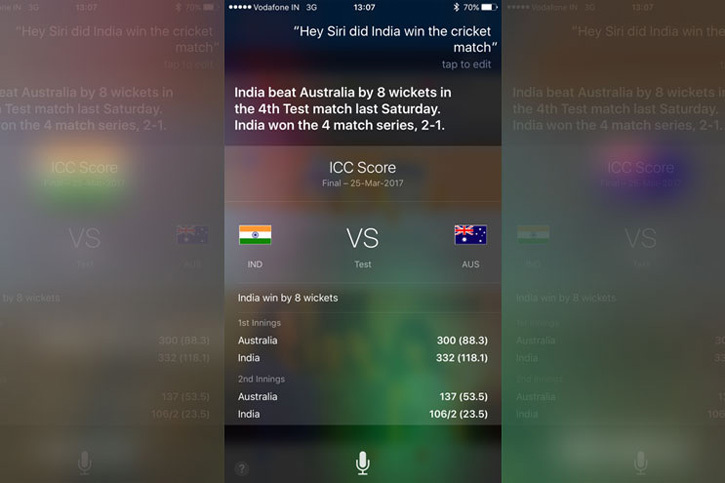 The Siri can now tell you the scores for cricket matches and can also pull in scores for the world cup and champions trophy. Apart from this, the AI assistant will also help you in booking Uber trips hours in advance and in paying bills. The updated App Store now allows you to rate the apps you are using. The developers can now ask users to write a review without switching to the App Store. This will help them understand the positive and negative aspects of user experience and subsequently can work to better it. The developers will also be allowed to respond to these reviews, making the entire arena more like a forum. This one is again for the developers. The new feature allows them to change the app icons without updating the app. However, to ensure that the feature isn’t misused, there are certain limitations to the feature. This feature is too small to get noticed by many individuals. With this now when you’ll close your app, you’ll get the rounded corner at the edges. The reason behind calling this change good is that the animation goes quite well with the rounded corners of the app icons. Keeping the same trend, Apple has also replaced the dashes by circles which can be noticed while entering the passcode. Apart from these, changes can also be noticed in the form of up/down arrows for switching emails in the mail app. 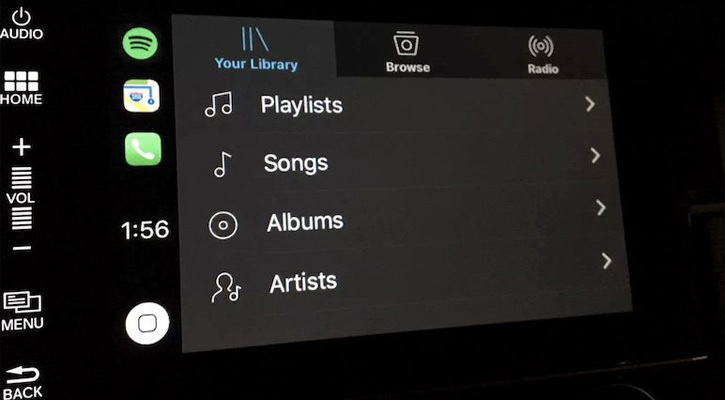 The control center can now be adorned with a podcast widget, which will allow you to listen to your podcasts quickly and to launch next one in your list with ease. Though this new widget looks very much like the one for music, but it doesn’t show recently played albums. Instead, it features just the cover art of the podcasts you are subscribed to. Changes start with the settings page. As soon as you reach the page, you’ll notice a new section featuring your photo and name. This section is housed with all the important information linked with your device. This includes your Apple ID, iTunes and iCloud information, and the App store settings. 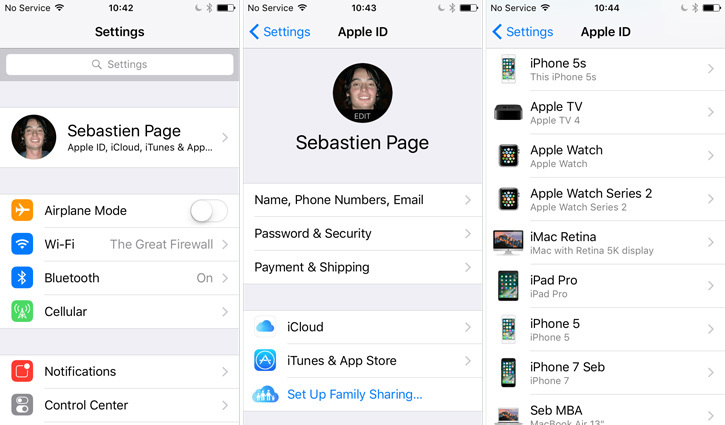 The new section allows you to update your payment information, set up family sharing, check iCloud storage, and to check the devices that are linked with your Apple ID. 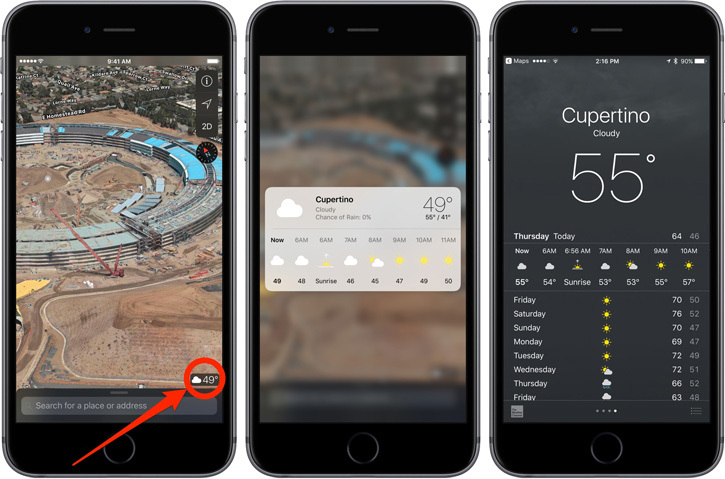 The maps app now enables you to have details about the upcoming weather conditions. The only thing you need to do is to use the Touch ID on weather icon to the right of the screen, and there you are with the details of coming six hours. This new feature will help the users to plan their travel accordingly and avoid unexpected and unfavorable weather conditions. The new feature will allow you to switch apps without going back to the home screen first. Also, the music app gets a new Up next screen featuring the list of songs that are in the queue and will also let you access the album view from the song screen. The Verizon customers here get a treat, as they can now use any iCloud-connected device to answer Wi-Fi calls. Previously this feature was available only for Sprint, T-Mobile, and AT&T customers. However, to enable this, users will have to go to phone tab to the settings page and enable Wi-Fi calling. Apart from this, you can also check your iCloud storage easily through a breakdown by going to iCloud settings. iOS 10.3 no doubts is loaded with some really great features. This is why we said in the beginning that Apple is well acquainted with the ways to attract and engage users at the right time. With this entire list of new features for developers and users, we look ahead to have future updates from the house of Apple.